Comic Memories – J. Edward Oliver. I always find it difficult to choose my favourites. When people ask me “what’s your favourite TV show?” or “what’s your favourite song?”, I don’t know how to reply, there are just so many choices. 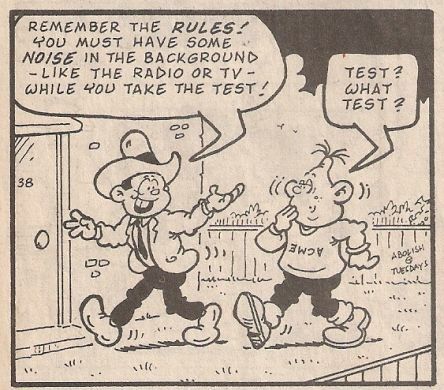 But when it comes to comic strip artists I definitely know who my favourite is so here’s a look back at the great career of the terrific J. Edward Oliver. Jack Edward Oliver was born in Dartford in 1942 and he went on to have an extraordinary career in cartooning that would last for 40 years. His career can be split into three distinct eras. The first era began in the late-60s when JEO created a comic book called Instant Garbage and in 1970 he joined the music paper Disc as their pop cartoonist. He created a very imaginative strip which featured the adventures of such strange characters as EC Ryder and Fresco-Le-Raye. 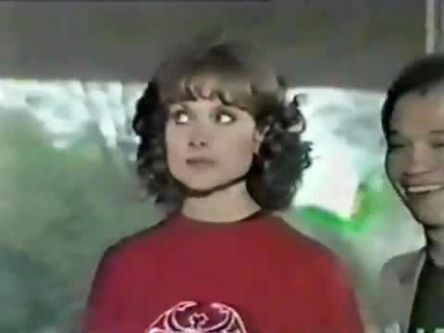 He would also mock the TV and pop stars of the day, and he was vaguely obsessed with the well-developed actress Madeline Smith. The strip was usually only half a page but the amount that was packed into it was remarkable. In 1975 the strip moved to Record Mirror. However, music tastes change and as the era of punk/new wave music was beginning, leaving JEO’s strip starting to look a little old-fashioned, people just weren’t interested in jokes about Showaddywaddy any more and he was dropped in 1977. 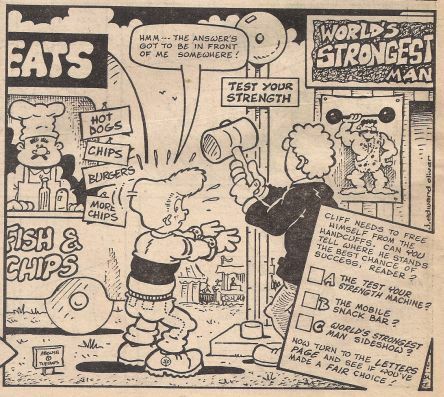 The second era began in 1979 when JEO joined IPC and drew strips for children’s comics including the weeklies Buster, Jackpot, Whizzer And Chips, Wow and Whoopee. 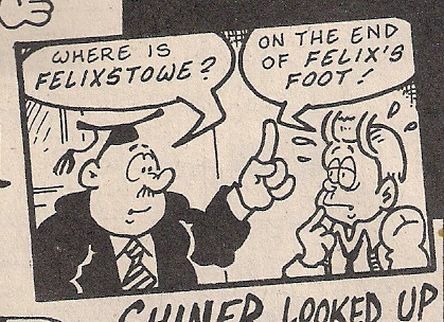 His work was also reprinted in fortnightlies and monthlies such as The Best Of Whizzer And Chips, Big Comic Fortnightly and Funny Monthly. 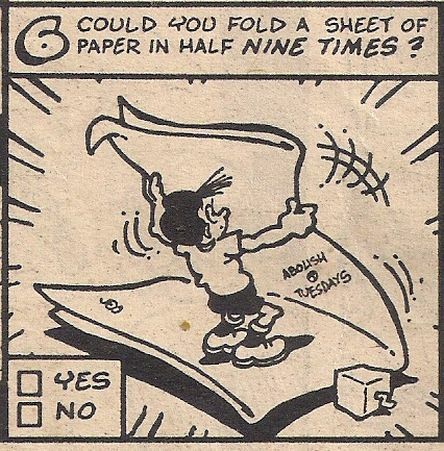 The strips he drew included Master Mind, about a boy who was always solving puzzles, and Cliff Hanger, where our hero Cliff got into a difficult situation and we had to make one of three choices to get him out of it. 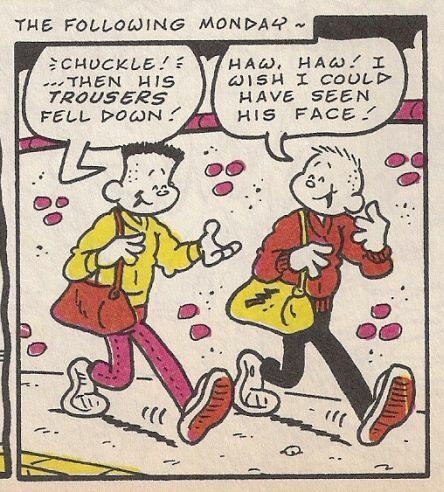 There was also Vid Kid (drawn by JEO under the pseudonym, er, “Sue Denim”) about a boy called Vic who had a magic hoofer-doofer and all the adventures that he had with it. JEO would also make an appearance in every Vid Kid strip. JEO would also do lots of other things in comics including designing the letters page and the blurb for the free gift on the cover. He worked at IPC for 20 years until their final comic Buster closed down and he drew the final strip for the final issue in 1999. The third era began in 2000 when a fan set up a great website that is worth looking at which is http://www.jeoliver.co.uk which collected all of his work from his Disc/Record Mirror days plus other projects and wondered what he was up to nowadays. JEO was eventually tracked down and invited to draw a new weekly strip for the site where he brought back the Fresco and EC Ryder characters plus lots of other silly ideas which he continued to do until his death. JEO died in 2007 age 64 which was a real shame because his work was as good as it ever was. Why did I become a fan? The first time I bought Buster 25 years ago now and discovered his work I became a fan right away. I really liked his drawing style, all the characters looked cute and his work which featured a lot of wordplay which was very funny. 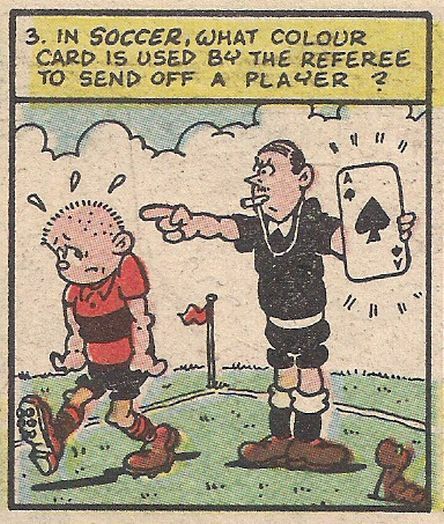 But not only that, there was the streak of weirdness that ran through his strips. There were always hidden messages in them, such as the famous “ABOLISH TUESDAYS” and a cube with a crank handle. He also kept a strong hold on his work by drawing the speech bubbles in his strips and writing the text inside them. JEO is one of those people where I look at his work and think “I wish I could do that”. I have tried to collect as many of his strips as possible and I do think he was brilliant, he entertained people of all ages with his work for four decades and if ever a book or biography of his work was published I would buy it in a flash. JEO is my favourite comic strip artist because he was consistently wonderful and the amount of work that he produced was remarkable. His work definitely deserves credit, he played a big part in enhancing my childhood. He is a real unsung hero and a true English eccentric and I’ll never forget him.